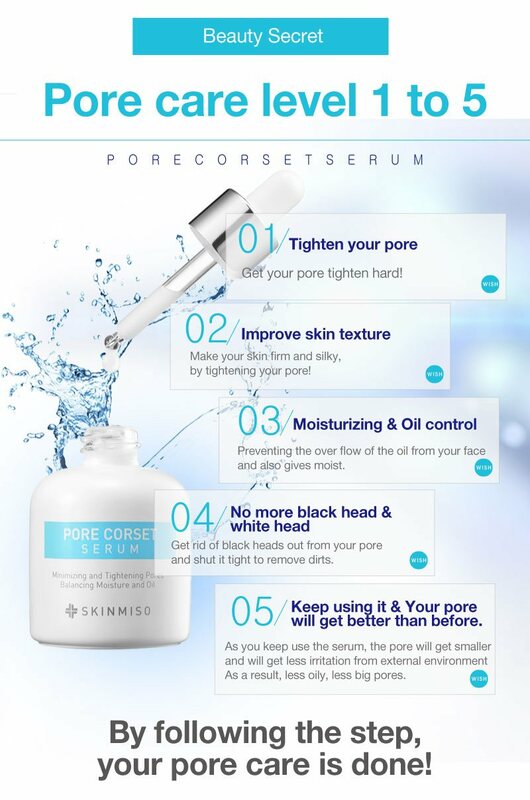 SKINMISO’s Pore Corset Serum is the best pore tightening serum. This pore tightening serum is perfect for people who have enlarged pores or pores that are filled with sebum that need some taking care of. Try using a pore tightening serum that has lasting results, with ingredients like natural plant extract HTHCP Complex, the Pore Corset Serum is your best choice for pore tightening ! This pore tightening serum is unlike any other serum. In Clinical studies, pores shrink 34% in size after using the Pore Corset Serum ! All in only 20 minutes! Apply to areas of face with enlarged pores. Gently tap with fingertips for maximum absorption. Cleanse your face thoroughly using Rice Foam Cleansing to completely empty out pores. Use SKINMISO’s Pore Beauty Nose Pack on areas of face where there is left over sebum. Apply Spot Repairing Serum to red, irritated spots and acne scars.